Modern life with its unrelenting competition often places special demands on the appearance of the professional person. 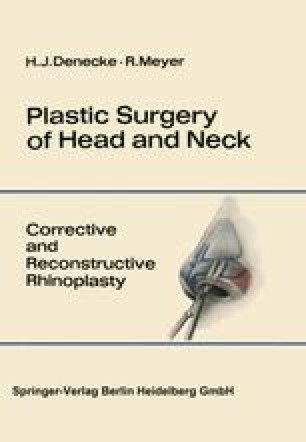 Thus it is that people often wish to have corrections performed on disfigurations und functional disturbances in the area of the head and neck. This desire is referred more and more to physicians. In addition traffic, industry and war, with their great numbers of injured, leave facial disfiguration or cervical scars which necessitate correction or reconstruction. One can not ignore a patient’s wishes, especially when functional disturbances are present or the danger of psychic injury exists in addition to an external disfiguration. — With congenital malformations and after traumas in early childhood the question arises at what age these deformities should be eliminated. It is quite certain that one should correct most disfigurations before school age, so that the children do not suffer an emotional injury due to the teasing of their schoolmates. Even benign, disfiguring tumors in the facial region should be removed as early as possible, even after the child is 3 months old, so that the parents are soon released from the psychic trauma. In the detailed section of this textbook we have indicated certain deformities which require correction at a very early age. But on the other hand, there are also deformities, e.g. of the nose, which should not be corrected during childhood, when the bony structure of the face is still growing. This is also discussed in the main part of the book. In later years, depending upon the patient’s good health, practically all deformities are operable at any time. With man’s increasing life-span, the question confronts us more and more often to what extent one should also attempt corrective or reconstructive surgery on aged patients. As a result of the improvement in medical care of patients well up in years, especially with regard to their circulatory system, can agree more and more to plastic surgery in the aged. The desire of a patient over 70 to have X-ray ulcers removed from the head or neck is understandable. One should not refuse to perform the surgery if no contraindication exists from the medical standpoint. The same applies to the correction of a sizable rhinophyma, especially when it disturbs the function of the nose. It has been shown that one can make use of tubed pedicle flaps from the trunk to the face on patients 75 years and older; it has also been shown that one can successfully transfer skin grafts from the upper arm at this age. In numerous cases we have performed plastic surgery on patients over 70. This is done with a specialist of internal medicine as standby observing the patient’s general condition. In the majority of cases we have obtained the same results as with younger patients.